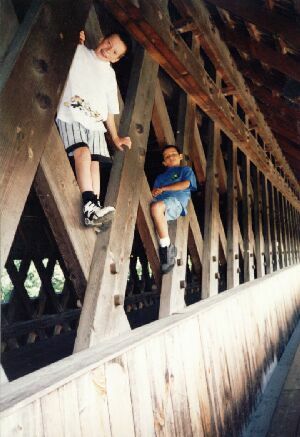 This is Jimmy with his best friend Steven Tinny at the covered bridge in Frankenmuth, Michigan. Both boys were mischievous, especially Jimmy. I remember one time we were coming out of Gags n Gifts , which was one of his favorite places. As we got into the car, Jimmy sat in the back seat, which he normally didn't do. When I asked him about this, he merely shrugged and said he just felt like sitting in the back for a change. Knowing Jimmy, this should have raised some red flags, but I let it go. A few minutes later, Jimmy suddenly pulled the collar of my shirt toward him and proceeded to pour itching powder down my back. If you've ever had this happen to you, you know it wasn't easy for me to drive! Talk about going crazy! Of course Jimmy laughed all the way home!